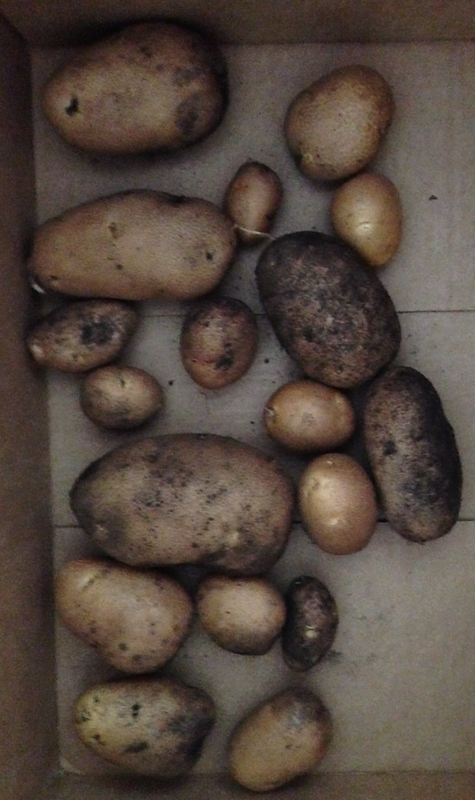 This was the first year I grew potatoes. I was a little apprehensive about doing so, because I was concerned about verticillium wilt and blight, which would wreck my soil for future planting of other crops. I’m glad I didn’t let my concerns stop me and call the whole thing off. I decided to go ahead and plant potatoes, but instead of growing them in the ground, to allay my fears, I opted to grow my potatoes in a grow bag. The bags can be found in brick and mortar nurseries, but I ordered mine online from Gardener’s Supply. By doing so, I was able to choose from five colors and two sizes. Growing in a bag prevented verticillium wilt from possibly contaminating into my soil. There are still smaller potatoes growing on the plants, which I will let continue to grow, and check on in a while. I am excited with my small success, and plan on adding another grow bag for my next planting. Next up, the when, where and the how. . .
Oh I would love to see those when you harvest them. Please post them. I will when I harvest them, but it is going to be a bit since they are just blooming. I also grew purple sweet potatoes this year, so I am exctied about them, too in containers!